Learn about the benefits of backing up data to AWS. Move away from traditional backup strategies that involve maintaining tape libraries and paying for offsite archival services. Details include conceptual architectures for customers at various stages of their cloud migration (hybrid infrastructure and cloud native), and easy next steps to begin backing up data to the AWS Cloud. Take one of our labs or tutorials to get hands-on experience with our services in a live AWS environment. When you're ready, launch a project and begin building your first live workload. Learn how to create S3 buckets, add objects, manage access, create storage policies, and use versioning. Learn how to create an EBS volume, attach an instance, create an EBS snapshot, and restore the snapshot. Learn how to create an Amazon EBS volume, create a custom AMI, launch an instance, and share the AMI. Securely store and access files at scale in the AWS Cloud. Use the AWS Command Line Interface (CLI) to access Amazon S3. Learn how to create a Linux system sharable elastic file system in the cloud. Use an AWS Snowball appliance to migrate petabyte-scale data into Amazon S3. Easily deploy and enforce compliance policies on archived data using Amazon S3 Glacier. The exponential growth of data is providing organizations with unprecedented insights to evolve their respective businesses, but it is also challenging traditional backup methods that cannot cost effectively scale to protect expanding data stores. Watch this office-hours tech talk and hear AWS storage experts discuss common use cases, backup for hybrid environments, backing up file systems and databases, among other topics. Review these reports for best practices and common use cases. Covers production workloads and architectures that can be implemented using AWS to augment or replace a backup and recovery solution. 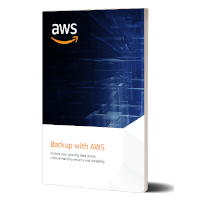 Compares tape backup with options available for backing up to AWS and includes three reference architectures to improve or replace traditional tape backups, on-premises tape libraries, and offsite physical archiving services.